Thanks to 3D simulation we can provide a wide range of tailor-made storage solutions and exhibitors. Using kitting trolleys made with INDEVA Lean System® complete with custom kit boxes reduces the production cycle times, improves part presentation in your assembly line, protects your delicate components, shortens production times and thus contributes to the reduction of production costs. 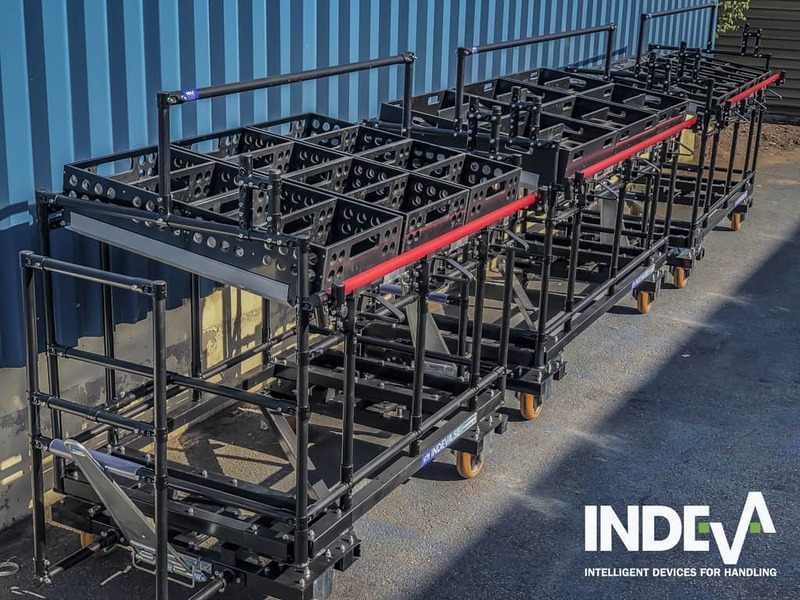 INDEVA Lean System® trolleys or carts contribute to reduce capital investment costs as they can be dis-assembled and all components reused to build new structures over and over. We provide 3D detailed simulation of your production set-up prior to manufacturing so that you can see in advance how your kitting trolley and kitting boxes will be and modify your design prior to manufacturing.